Here we try our best to anticipate and answer any questions or concerns we know all couples have! If we have failed you, please feel free to contact us! Q.How experienced is Sway Social? We’ve been playing across the country for the past decade and each member of the band is an accomplished singer who has served as frontman of a band at one time or another and in all probability will have played in your venue before. Take a peek at our history here. In short, how experienced is Sway Social? Very. Q. We are really eager to book our band as soon as possible. When can we view you next? Nothing compares to experiencing Sway Social LIVE. And, unlike most other bands out there, you don’t have to wait a long time to view us at a monthly showcase. This is simply because we are booked by some of Dublin’s finest establishments nearly each and every weekend. If you’re on the hunt for an amazing band then you have an ideal viewing opportunity to view us every weekend, no waiting around. Check out dates/venues here. Q. Who will look after my booking? Our dedicated bookings coordinators Joanna and Niamh work personally with all of our couples every step of the way to ease any worries and answer all questions.They’re the team behind the MusicAngel group and they manage a range of acts including The Best Men and The Beat Boutique. Q. What’s the deal with deposits? You have the option of paying a deposit. Once this has been received your date is saved and we’ll send you a booking form to make things official! This is, of course fully refundable up to six months before the date (guaranteed to be returned to you within two working days by An Post express post). Payment options include laser or credit cards, bank transfer or cheque. Q. Do you play for Civil Ceremonies or can you point me in the right direction? We do indeed. Check out Civil Ceremonies by MusicAngel, the one-stop portal for civil ceremony entertainment run by our team at MusicAngel. Q. What if you’re too loud? We’re seasoned professionals used to playing to venues and crowds of every imaginable shape and size. We consider the specifics of your wedding and tailor our performance to fit accordingly. Q. How much time do you take to set up? How long do you play for? We can be quick when we need to be… around 40 minutes is all it takes to achieve total sound perfection. Once we’re all sorted you have us for up to 3 hours including a 20 minute break to rest our pipes (don’t worry- we’ll co-ordinate with the food and function to make sure there’s no awkward silences on the night). Q. Do we choose the band’s playlist for the night? With our extensive experience of crowd response to songs (depending on time of the night and song order), we are experts at judging what songs will get everyone up on the dance floor from start to finish. This has been perfected from the vast number of weddings we play each year, so is ideal. After 10 years of experience, we pride ourselves on gauging the crowd on the night and judging what songs will keep the dancefloor rocking all night long/ We normally suggest that you provide us with a handful of songs which you would definitely like played (and any ones that you really don’t want!) from the setlist and we will of course accommodate these. After that, trust us, we get it right every time. Q. Are Sway Social Wedding Band 100% LIVE? YES. The band do NOT play any CD’s, Tapes or backing tracks at any time. We are proud to confirm that Sway Social are 100% LIVE. Q. Can we choose our own ‘First Song’? Of course. We’ve been working with brides and grooms for years now and fully understand the significance of a couple’s first song. We’re more than happy to tailor our performance to make sure your day is exactly how you want it. Alternatively, if you would prefer to have a CD played to accompany your first dance, we can play it through our quality PA system. If you are stuck for inspiration for a “first dance” song, we’ve made a list of some of our favourites to play at weddings. Have a look and you might find something that you like! We’re a sleek and modern band who always arrive suited and booted, so you can be sure we’ll be well put together for your big day. Q. Do you provide your own equipment? We provide all of our own sound and lighting equipment. We’re well versed in taking care of every aspect of an event’s musical entertainment, so you can rest assured you’re in the ablest of hands. Q. What instruments do you play? We’re a 100% live band who sings and also features drums, bass, guitar and keyboard. Q.Can you play Waltzes/Jives songs for the older guests? Yes. We can easily include waltz sets during the performance. We can also play jive and rock and roll, which are sure to keep the oldies happy. Having said that, we have no problem omitting this style of music from the set on the night…you decide. Check out our setlist for more. Q. Our venue requires Public Liability Insurance, do you have this? Not a problem. Quite often wedding venues will require a copy of wedding supplier’s insurance details. Please rest assured that Sway Social are fully insured and should your venue require a copy of our policy, it would be our utmost pleasure to forward on these details. Please be wary of companies currently offer wedding bands whose members may only be meeting for the first time on the night of your wedding. The band you select for your wedding is one of the most important choices you will make. Imagine booking a band for your amazing day, but then a different band shows up. Perhaps it’s the same singer you liked at the showcase, but the band is entirely different to what you saw, comprising of musicians who have never met before that moment. This ‘band’ will call themselves the same name as another ‘band’ who are playing at another wedding on the same night as yours. And another wedding. A fleet of bands with one name, each comprised of, well, whoever’s free. Incredibly, this is happening all the time. Sway Social are an actual BAND. We’re four people who’ve known each other for years and played together a thousand times (Honestly, no exaggeration). There is no substitute for the tight, bonded quality of a band who live and breathe each other’s rhythm and have done so at countless gigs. 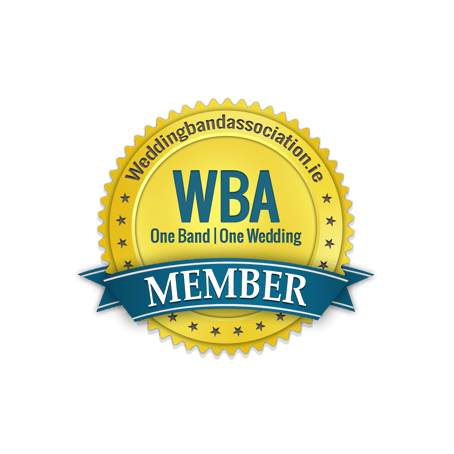 In short, be careful when selecting your band, do your research and make sure they have the coveted Wedding Band Association Seal Of Approval.